Despite the challenges, key work has been done over the past three years which will ensure that the SA-FX partnership is set in good stead for the future – and there are many examples nationally of SA-FXs which are engaging with people in new ways. From new models of church for incoming Roma migrants in Kent – “messy, chaotic, intergenerational, and often people’s first ever experience of church” – to coffee shops established by churches to engage with people in areas of economic deprivation in London, Andrew speaks of SA-FXs across the country which are offering new models of church in culturally relevant ways for their context. 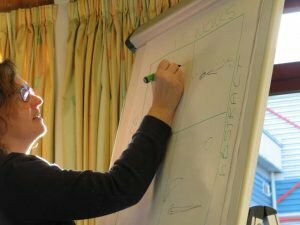 One rural expression is perhaps particularly contextually embedded – developing equine ministry amongst people with disabilities in the Forest of Dean! Posted in Story and tagged Andrea Vertigan, Andrew Vertigan, Booth, Roots, Salvation Army, Vertigan.